With two long filamentous basal leaves and tiny lanceaolate or spathulate stem leaves, this lily is distinguished by its green-lined yellow petals backed by shorter narrowly oblong sepals. Individual flowers are typicall 3cm across and each stem bears on, two or three flowers. This member of the Lily family can be found in former Yugoslavia, Greece, Crete and Turkey. Dry, stony places and grassland are its main habitats and it can occur quite high up in mountains. The flowers appear from January through to the end of April. 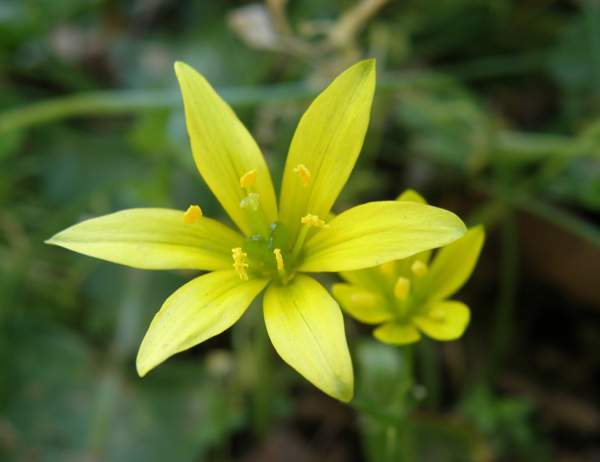 The genus Gagea is named in honour of English naturalist Sir Thomas Gage (1781 - 1820).